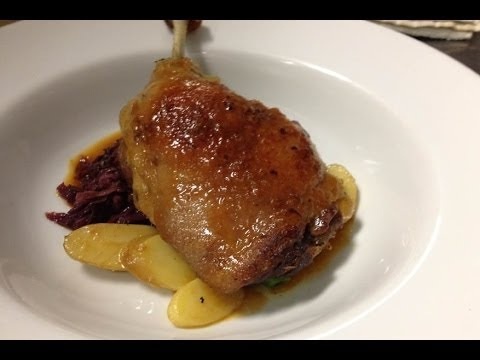 Duck confit is probably the most famous dish from Gascony, it is a duck leg that is salted & then cooked in duck fat. Confit is a centuries old process of preserving meat in its own fat, the only way then to preserve meats, before the refrigerator & freezer. In Gascony the confit is made with legs from the Moulard duck from the Foie Gras producers, these ducks are bigger breed therefore have much larger legs. The process of confit starts with salting the duck legs with aromatics, you would combine herbs & garlic with salt, this is rubbed into the duck legs & they are layed out in a covered dish in the fridge for around 12 hours, you don’t want to leave the legs salted for too long as you do not want them to taste to salty. After the curing time in the fridge take out the duck legs & brush of all of the salt cure & pack the duck legs snugly together in an oven proof dish & completely cover with duck fat. Cook at 90 centigrade for 3 1/2 hours until the meat starts to come away from the bone, do not cook above 90 degrees as the meat will fry & go really stringy. To finish the confit or reheat at a later date, preheat the oven to 170 centigrade, place the duck legs in oven dish skin side up & roast for 10 – 15 minutes until crispy all over. Confit is a perfect partner to braised red cabbage with some fruit such as red currants mixed through it & some puy lentils, Bon appetit. Mike, Thank you for making our first canal barge cruise on the Rosa a memorable gastronomic experience. The magic that came from your “kitchen” during our cruise was truly amazing. Your genuiness is reflected in your food and wine pairings. We hope to see you again soon. Thank you Tony & Darla, it was a pleasure to have you on board for the week, I look forward to maybe seeing you again in the future.